In a quick glance, one realizes just how prominent dance is at the Utah Arts Festival and how it encapsulates the deep roots of Utah’s incredible dance culture. Salt Lake City is home to one of the most active dance performing arts spectra, even accounting for the city’s size. In addition to Samba Fogo, Salt Lake City’s cultural ambassador for samba and Afro-Brazilian dance and music; RUUDDANCES featuring Ballet West and Art Emotion, and The Bboy Federation with its nightly dance competitions in The Round stage, the festival brings three long-time pillar companies of the dance scene to the festival stage. Daniel Charon, artistic director, says the company’s festival program offers five excerpted selections of different voices so that visitors can sample the broad range of repertory work the company aspires to in its regular season. The first work features an excerpt from The Opposite of Killing, a 2011 work by Bulgarian choreographer Tzveta Kassabova that the company presented last September at its fall concert. The work represents the various emotions one experiences because of the absence of a close friend. Kassabova, who also has a background in astrophysics and mathematics, infuses her work with strong musical and physical sensations. The excerpt being presented highlights the hope and optimism in a valued friendship even in the person’s absence. The Opposite of Killing, Ririe-Woodbury Dance Company. Photo Credit: Stuart Ruckman. The second work is Charon’s Elegy, created last year in memory of the victims killed during the mass shooting at the Pulse nightclub in Orlando. Suggesting a ghost-like memory, the work was choreographed to music by Bach. The third work is Super We, a collaboration between Kassabova and Raja Feather Kelly, who also wrote the music as inspired by Laurie Anderson. It’s a rapidly paced duet that parallels the hectic rhythms of contemporary life. 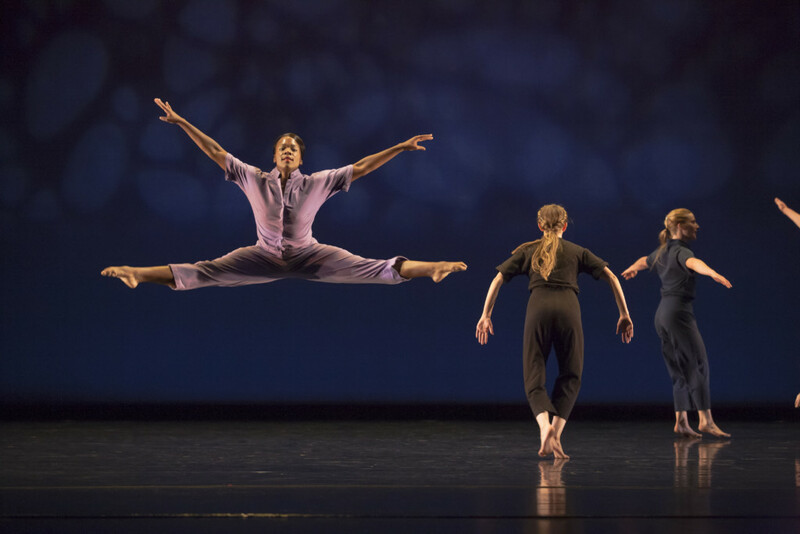 Physalia, the fourth work, comes from 40 years ago and was choreographed by Moses Pendleton and Alison Chase, the founders of the Pilobolus Dance Theater. With an original score by Robert Harris, Physalia is a Portuguese man-of-war and the dance is a marvel of contortion and acrobatics that suggest the foundations of the traditions behind Cirque du Soleil. The final work on the program will be Storm, a 2011 composition Charon choreographed with original music by Michael Nyman. It is an exuberant piece with the appropriate kinesthetic grandeur to close out a festival appearance. The company’s 54th season will open in September with a concert titled Parallax: An Evening of Contemporary Dance, featuring two world premieres by Charon and Kelly and a Salt Lake City premiere by Kate Weare, whose work Unstruck explores body and sound in terms of emotional inflections and resonance and timbre. Storm. Ririe-Woodbury Dance Company. Photo Credit: Stuart Ruckman. Kelly, who is deeply inspired by the legacy of Andy Warhol, has created Pantheon, which transposes the pagan and ritual sacrifice elements of Stravinsky’s Rite of Spring to 21st century pop culture and the demands that culture puts on its audience. Charon’s work is Exilic Dances, which emphasizes the interplay of community and individual identity and the value and essence of accepting strangers in the communities of the diaspora. The winter concert will offer a sampler of six contemporary dance works while the spring concert will complete the Together Alone trilogy Charon has choreographed over the last several years. The evening-length work, inspired by science fiction, will include an original score composed and performed live by the Salt Lake Electric Ensemble. Ririe-Woodbury Dance Company: Contemporary Repertory from Ririe Woodbury on Vimeo. Charon adds that the upcoming season will include a Moving Parts Family Series, in which the company will present shorter concerts as Saturday afternoon matinees, lasting no more than an hour and that will be open to family members of all ages. In addition, the company will offer programs with bilingual narrations. Later this summer, the company will offer different intensive workshops geared toward different groups, such as professional dancers of college age, dance teachers and high school students. Other highlights for the upcoming season include a Nov. 4 performance at the Jewish Arts Festival at the Salt Lake City Jewish Community Center and a pair of Kingsbury Hall performances with Doug Varone and Dancers on Feb. 23 and 24. Dancers for the festival performance will be Yebel Gallegos, Mary Lyn Graves, Megan McCarthy (making her first formal appearance with the company), Daniel Mont-Eton, Bashaun Williams and Melissa Younker. Elfwyn’s Saga. Children’s Dance Theatre. Photo Credit: Jeff Allred. A perennial favorite, the CDT always meets the challenge of enchanting audiences with its original productions. Taking a highly regarded children’s book, teachers, costumers, musicians and other production crew adapt the story to a large-scale production which includes an original musical score and typically about 400 costumes and 300 young dancers. The production premiered this spring at the Capitol Theatre to both school and public audiences. 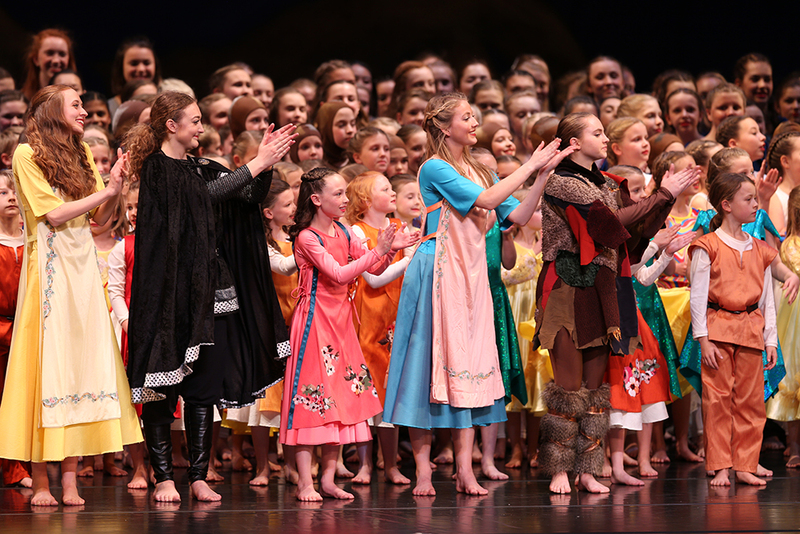 CDT’s productions always impress in terms of size – scores upon scores of dancers ranging in age from second grade through high school – as well as scale, including costumes and props. Tristan Moore, CDT’s resident composer, wrote the Elfwyn Saga score and Wendy Turner, Cynthia Turner and Nancy Cook created costumes. Lee said Moore’s score really deepened the characters and helped the dancers experience and respond to Nordic cultural traditions. CDT also made significant progress with two recently launched initiatives. The Elevate Theater Company, a musical theater company for performers with disabilities, embarked on its second production — a full musical theater piece titled Press Start. The project allows students to explore the Broadway musical theater repertoire and how emotions can be portrayed in various settings. There are classes for singing, dancing and acting, as well as opportunities to expand on memorization and mobility skills. “Each Saturday morning these enthusiastic actors, dancers and singers come to Tanner Dance in a joyous community of individuals who share their talents, aspirations and dreams with one another,” Lee explains in a director’s message. “Students dance, sing, and act in a disciplined but supportive atmosphere where they are challenged physically, cognitively and emotionally. This year these students have made remarkable progress and have grown in self-esteem and self-efficacy.” Registration is open for fall classes. Meanwhile, the LEADD Program (Learning and Engaging through Arts Discipline and Development) offered its first performances last fall. It is an arts and education program for adults with disabilities, where students can learn life skills through the artistic genres of dance, music, theater, visual art and creative writing. The LEADD Program meets twice weekly during the afternoon. After a 51st season that was as radiant as its golden anniversary celebration, RDT’s festival appearance continues the jubilant tone, according to Linda Smith, artistic director and co-founder. “We’re offering an entertaining repertory about who we are and the story we want to tell,” she adds. The program opens with a greeting to festival visitors that the company uses regularly in its lecture demonstrations to school and community audiences. Called Steppin, it features a rhythmic chanting game with dance steps and vocals but no music. The second work is Opus. Jazz Loves Bach, a 1973 work created originally for RDT by Matt Mattox, which Smith recalls as being one of the most difficult pieces she has ever learned. The work, in four movements, is set to Bach music performed in a jazz style by the Wayland Quartet from a 1963 recording. According to a 1974 article in the Salt Lake Tribune, the choreography called for as many as 300 different steps in just one movement. The third work is Energizer, a 1980 work by Molissa Fenley that was restaged in 2013. It is a wonderful display of precise athleticism and technical bravura, which should be a certain crowd pleaser. The company follows up with a couple of sections from the historical masterpiece Mazurkas by José Limón (1958), which also suggests some of the most important artistic developments in the evolutionary path modern dance has followed since the middle of the 20th century. The program closes with a classic crowd pleaser choreographed by Joanie Smith and her late husband Danial Shapiro. Turf, which became one of the Millennium Commissions leading up to the 2002 Winter Olympics in Salt Lake City, quickly became an audience favorite. With original music by Scott Killian, dancers alternate between friendly and aggressive rivalries as they battle for throw rugs and carpet remnants. Even as Turf ventures periodically into serious moments, the work never loses sight of its basic humorous structure. 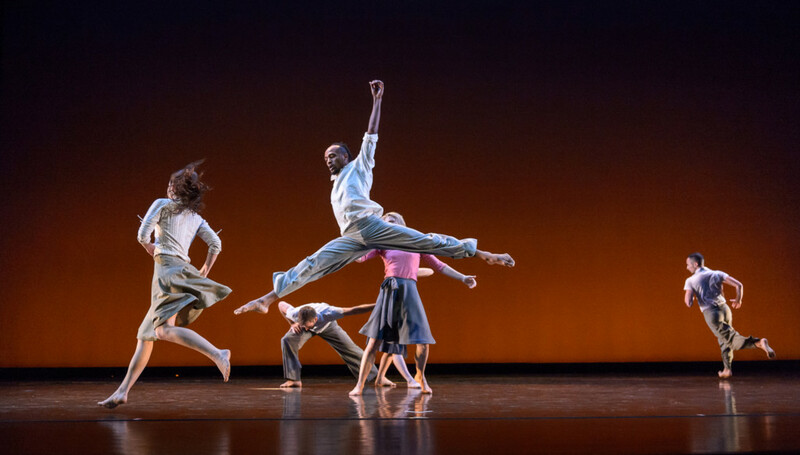 The nation’s oldest repertory dance theatre, RDT has christened its upcoming 52nd season with the theme of Monumental, which includes the most extensive concert schedule in its history. The opening concert in October is titled Sanctuary, featuring the world premiere of a work commissioned by RDT and choreographed by Zvi Gotheiner, a long-time collaborator, that celebrates the recently designated Bears Ears National Monument in Utah. The concert also will include the largest number of dancers ever on an RDT stage as they perform Tower by Andy Noble, an RDT alumnus who now directs his own company in Houston, NobleMotion Dance. The work, featuring 33 dancers and including guest performers from Utah Valley University, pays tribute to the area on which the World Trade Center stood before it was destroyed in the 9/11 attacks. The program includes a restaging of Eric Handman’s Ghost Ship. The holiday concert will honor the work of Bill Evans, one of RDT’s earliest alumni and veteran choreographer while 2018 will open with Emerge, featuring new works choreographed by the company’s dancers. The company’s current roster of dancers has been intact for six years, the longest since the company’s earliest years. The season continues in February with Regalia, the company’s major fundraiser which includes a choreographer’s competition; an encore performance of Gotheiner’s evening-length work titled Dabke, and the closing concert will be Current, featuring world premieres by RDT alumni Francisco Gella, Sarah Donohue, and Angela Banchero-Kelleher along with the winner of the 2017 Regalia choreographer competition, Nichele Van Portfleet.